IRCTC (Indian Railway Catering and Tourism Corporation) has issued a press release for the posts of Supervisor. 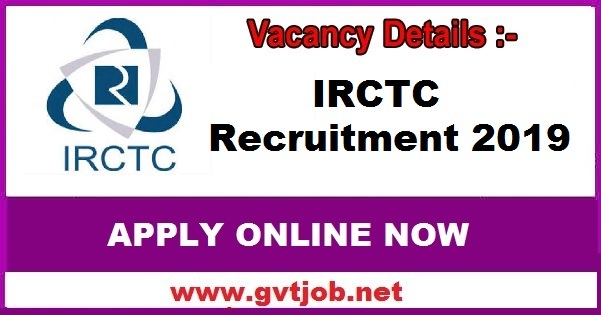 The total number of posts issued in IRCTC Recruitment 2019 is 100. In order to apply for these posts, candidates must have graduation and other prescribed qualifications according to the posts. The maximum age limit for candidates applying for the applications received is 30 years. The applicants will be selected through interviews in supervisor positions. Interviews will be held from 05th February to 15th March. Interview will be conducted for candidates who are willing to apply for a job. The interview arrived at the interview site from 05 February to 15 March 2019. The full details of the interview are fully recorded in the IRCTC official notification. For more information visit the official website and read the notification. Applicant should have a B.Sc in Hospitality and a Hotel Manager degree from a recognized institution. Read the notification for more information. The maximum age of the candidate has been fixed at 30 years. Click here for government job related information. Selection Process: Selection will be based on medical test and interview. See the notification for IRCTC-related information Click here.